One of our most popular series each January, it’s time to look back at last year and let our readers decide some of the top plays of the year. We’ve already honored some of our own favorites from 2018, but now it’s your turn. First up this year is our Block of the Year bracket. We watched many hours of game footage and highlight reels to hunt down the best defensive plays we could find; believe us, there were more than enough options to fill up this bracket, so even some worthy nominees were left on the cutting room floor. Over the next week, we’re inviting you, the Ultiworld readers, to vote for your favorite of the finalists selected. Check out all of the nominees and vote below, then check back to see which clips advance for another opportunity to participate. The first round of voting starts now and closes on Friday, January 18, at 12 PM Eastern. Catching a Callahan is pretty damn cool. Catching a layout Callahan is even cooler. But a poach layout Callahan? At the World Championships? Against your regional rival? Come on. Brute Squad veteran Amber Sinicrope used every ounce of her experience to sniff out this block opportunity then displayed impressive athleticism to pounce when the chance presented itself. She earned the right to swagger in her walk-off spike. After years of making big plays for the Scandal D-line, Allison Maddux joined the Space Heater juggernaut in 2018, almost an afterthought when read next to some of the more well-known names on the brand new roster. But you can be sure DC knew exactly what kind of defender they were getting with Maddux — and she delivered the goods when it mattered most. Tasked with the unenviable job of containing Carolyn Normile in the national semifinal, Maddux bit just enough on an under fake for Nicky Spiva to put up a huck to Normile deep. But Maddux put her head down and won a footrace to the endzone against the young AMP star, saving a goal late in the game with a stellar high layout block. As has become an annual tradition, Manuela Cardenas produced several blocks worthy of inclusion in this bracket. Everyone should go watch some Colombia highlights from WJUC and U24s this past year, but this block from the USAU Club Championships might have been our favorite from the wonder twin this year. This is Cardenas at her athletic best, baiting a throw then using her unreal speed to close the gap in a flash before flying safely through the air and around her mark to snag a layout block. Defensive plays like this have become scarily frequent for the Colombian; even scarier for opponents is that this year she was honored as a runner up for our Offensive Player of the Year award. Sometimes, Jenny Wei just needs to feast. It’s not Ellen Au-Yeung’s fault that she happened to be the one on the poster in this instance — she’s a two-time All American performer who does plenty of feasting of her own. But as soon as this hanging throw went up, it was clear there was only going to be one outcome. Wei lined this one up from three steps away, went up strong early, and left nothing but wreckage in her wake. Her teammate on the sideline stands mouth agape, bearing stunned witness to the raw power on display. Long live Jenny Wei. We’ve already talked at length about how good the game between Moscow Brilliance and Japan’s HUCK was at WUCC this summer. If you haven’t watched it yet, please drop everything you’re doing and go remedy that situation right now.1 In a hotly contested game where every matchup battle felt like it was being waged on an epic scale, Aleksandra Pustovaya came up with one of the blocks of the tournament. If you can manage to take your eyes off the…let’s call it “active” mark, take a look at Pustovaya’s footwork as she blankets her matchup before absolutely stuffing a dump pass off the line in the endzone. One of the breakout stars of the U24 World Championships in Perth last January, Kaede Yoshida was absolutely everywhere defensively for the Japanese women. In her squad’s must-win matchup with Colombia, Yoshida came up big over and over, managing several huge blocks against even the most athletic players in the world. Here, she aparates out of nowhere to deny what looked to be a sure Colombian goal upwind. UC San Diego was one of the surprises of the college season in 2018, and Dena Elimelech was the breakout star. While those in the Southwest may have known about her previously, the Stanford Invite was Elimelech’s coming out party for a national audience, as the Psychos obliterated the competition in Stevinson with Elimelech leading the charge. Her layout handblock against British Columbia’s Naomi Morcilla was the highlight of the weekend and perhaps the point block of the year;2 after repeatedly proving her dominance in the air, Elimelech’s quickness and defensive instincts on the handblock were a demoralizing and emphatic statement that she was no less of a threat closer to the ground. In her first year with Rogue, Arellano was a defensive beast for DC throughout the 2018 Youth Club Championships, helping her squad get back to their second consecutive U20 Girls final. In the second half of Rogue’s semifinal against California Current, Arellano spotted a chance to help on a deep cut. Starting a solid 15 yards behind the receiver when the huck went up, Arellano turned on the jets to cover the chasm between them, arriving just in time to knock away a game-tying goal with a chest-high layout. Arellano may not have come into the weekend with as high a profile as some of her older teammates, but she certainly won’t be sneaking up on anyone in the future. Oh, and she’s only a junior in high school. Few players were as good in 2018 as Matt Gouchoe-Hanas was. Before picking up Men’s D-I College Player of the Year honors with UNC last spring, he served as a steady center handler and defensive playmaker for the mixed team representing the US at the U24 World Championships in Perth. His relentless workrate produced several key blocks for the squad, including this one from late in the second half of a very tight tournament final against Japan. It was his second layout block of the point and helped the US earn a crucial upwind break to get within a point of a world title. North Carolina and Oregon were locked in an absolute battle in the semifinals of the Stanford Invite, even in the moment feeling like a game-of-the-year type atmosphere. Both teams had exhibited blistering offensive pace and execution throughout, with only eight total turnovers in the game prior to double game point. After receiving the final pull, Ego methodically marched the disc down the field and called a timeout inside the red zone. When the disc was tapped in, they ran a play to put the disc in the hands of their Callahan nominee Adam Rees, who quickly turned and put up a backhand to the breakside for the win. Instead, Elijah Long went full extension for the game-saving block. A huge play to cap one of the year’s best games. One of the best parts of playing beach ultimate is that almost everyone is willing to lay out — the landing is so much more forgiving than on hard ground or turf. Plus, with the constantly shifting sand underfoot, the game moves a little slower and is contested a little closer to the ground. Well, at least for most people not named Marques Brownlee. Even with the little purchase available to push off from the sand on Virginia Beach, ultimate’s resident YouTube superstar managed to hurl himself high into the air, scratching out a block in a layer of the stratosphere where mere mortals would pass out from a lack of oxygen. Plays like this are why Brownlee was able to help Humiliswag to their first national beach title. Amsterdam’s GRUT has become a fan-favorite the world over for their high-flying play and absolutely fearless style. Both of those are on full display from Basten De Jongh here, as he goes up for a HUGE block at the World Ultimate Club Championships in Cincinnati last July against Philippines Mulatto. After losing the position battle to the force side, De Jongh has no choice but to go up and over his opponent to deny a goal. It’s not often that pulls are given the public credit they deserve as a critical element of a team’s defense. But sometimes a pull is so good, it simply cannot be ignored. John McNaughton has been doing this for years down in Australia, but this one from the Australian Ultimate Championship national final is about as perfect a pull as you’ll ever see. Brisbane teammate Timothy McAllister gets credit for finishing off the play with a first-throw Callahan goal, but there’s no doubt McNaughton was — at least — equally responsible for the break. Jonah Wisch had a fantastic year in leading Pittsburgh back to a national final in what many prognosticators believed would be a down year for The Program. But it’s hard to imagine he had many more satisfying moments than this one last spring. There can’t be many out there who have ever witnessed a point block caught for a Callahan — even fewer can say they did it, nevermind in a tight game against a bitter rival. A tremendous individual play that got his team back to tied after going down big to UNCW to start their battle at Easterns, adding another chapter to one of the best rivalries in college ultimate. One of the more iconic blocks of the year, Von Alanguilan’s full-extension D against Ring of Fire in the opening round of the Club Championships was practically a poster for his Defensive Player of the Year candidacy. Far from his only highlight block in San Diego, this was Alanguilan’s finest. When this throw was released, it appeared it would be well out of the Machine veteran’s reach. At no point in the flight of the pass did that perception change, even as Alanguilan launched himself horizontally as if shot from a cannon. Yet with a last second flick of the wrist, all of a sudden Jack Williams’ sure goal was sailing out of bounds beyond his reach. Some blocks just seem to defy physics. This pass travels approximately five yards. When it is released, Hunter Taylor is completely obscured, shoulders squared up directly behind the receiver. And yet by the time the disc arrives, Taylor’s body has traveled up, over, and around such that he is entirely in front of the Ranelagh cutter to catch the block. There is almost no conceivable flight path for his body that could explain how he goes from his starting position to where he finished the play that doesn’t involve bisecting his opponent along the way. And yet he conceived of — and cleanly executed — one. I’m still not sure I understand. Did your favorite defensive play from 2018 not make the cut? Feel free to let us know and share a link in the comments. 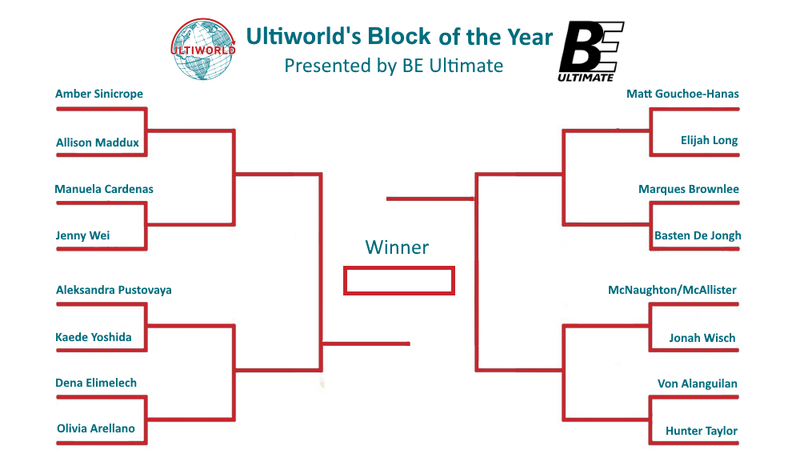 Comments on "Ultiworld’s 2018 Block Of The Year Bracket, Presented By BE Ultimate"